Teeth; 1/2" dia. x 6" oak doweling, 12 ea., set 1" from the ends and spaced 2"
Cross Braces; Ash Withes, cut green then kiln dried on a form, then shaved to proper diameter. 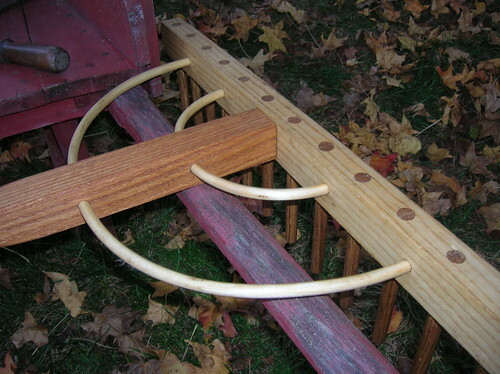 Set in 3/8" holes centered at 4" and 8" from the handle end, and 4" and 8" from the handle center midpoint along the head (3-1/4" and 7-1/4" from the handle sides). Been putting the rake to heavy use over the last few days cleaning up the garden area, and I'm happy to report that the shims have held it together very well. It's also starting to take on a nice, honest patina, and my hands have taken on the very pleasant smell of the linseed oil that's been rubbed into it several times since it was finished. The rake is looking better with every use, and has become one of my most valued tools. Not only has it served well for raking up garden litter and compost, it's been invaluable for laying out the rows and cultivating. As noted in my garden journal I've been using the 24" head and 2" spaced teeth for measurement, and it's also served well as a square. I've also incised a thin line in the handle 30" up the handle from the head for wider spaced rows. No more guess work by eyeballing and pacing off, no more need for an additional measuring stick. Before I brought the rake out to use last week I was a little concerned that the wedged joints would be loose from drying over the Winter, but such wasn't the case. Apparently the Linseed Oil did it's job over and above the nice patina it added. As the rake swells with use in the damp soil the joints have gotten even tighter, and further coatings of oil will keep it tight, and mixed with honestly gotten soil will further add to the rake's character. WOW! That looks great! How long did it take you to make it? Thank you Gren. 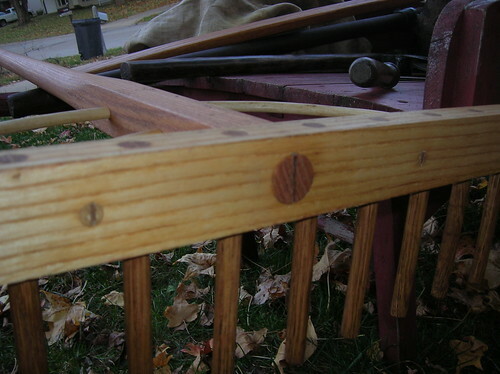 It took me between 3 and 4 hours all totalled to make the rake, and roughly an hour of that time was spent just in calculating where and how the parts should fit together and laying the measurements out on the wood. For the bent ash cross I braces spent maybe 3 hours drying them in a low oven once they were bent around the jig, then left to air dry another 3 days, but I don't count the seasoning time because it was hands-off work once I got the withes bet into the jig. 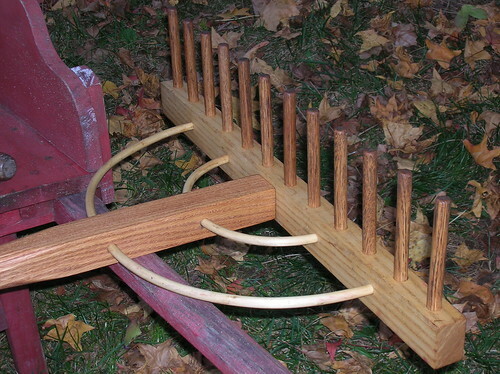 The jig was made with nails driven into a plank at points marked off with dividers, and took maybe a half hour to make. Both jigs were were laid out on the same plank, nested one inside the other. Once I had the head drilled, the handle shaped, drilled and notched for the wedge, the teeth cut to length and notched, the wedges made, and the braces made and shaved down to fit, it all went together fairly rapidly. To finish up I cut The protruding ends of the braces flush with the face of the head, split the ends with a chisel and drove the wedges into the splits, then I gave it a few intitial coats of boiled linseed oil cut 50/50 with turpentine. 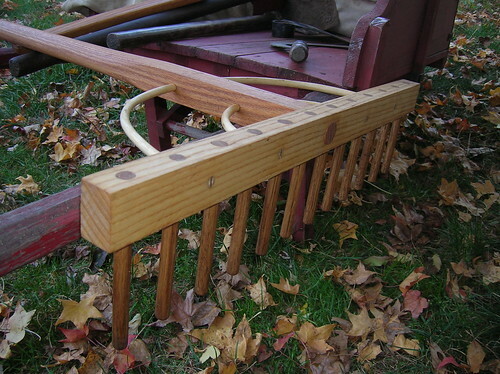 These rakes, like most every other 18th century trade or industry, are far from being rocket science or beyond a basic level of practical skill. Anyone can make one. Thanks a lot Guys ! ! ! Nice to visit this forum a lot of lessons that ive learned . 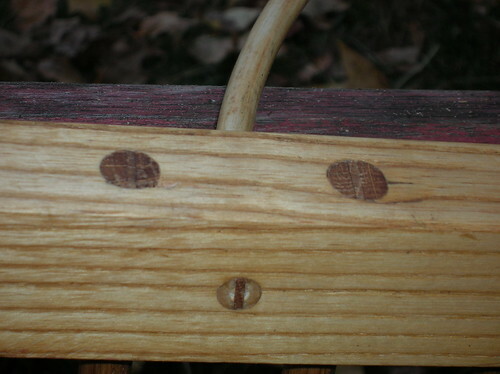 . .
Jim - Did you make your hay fork as well? Very nice job on the rake. Both look great in your farming pics.